Having decided to celebrate my nine-year-old grandson’s birthday by going to an adventure park of rope courses and ziplines together, I proposed to him that I would do—or try to do–whatever he could do if he would do—or try to do—whatever I could do. Deal? Deal! Hey, I’m a yoga teacher. I should be good at this. The park was lovely and well-kept, with no gaudy signs, artificial sounds, or food for sale. Between the huge trees were rope bridges at different heights, ziplines and rope ladders to get from one part of a course to another. Before beginning, we were oriented to the equipment that kept us from falling to the ground. 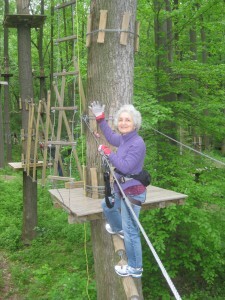 Each harness had two large carabiners, as well as another attachment for the zip lines. Before and after we scaled each element (bridge, ladder, zipline) we had to use the tweezle, a small mechanism attached to a tree that locked and unlocked the carabiners. So the rhythm was press tweezle, lock, unlock, move carabiners, scale element, tweezle/carabiners again. Fitted with the harness, I began to feel the excitement that comes just before trying something new. Once we chose the course, my grandson went first, I second and my son third. As I made my way across each rope bridge between the trees, I experienced the total absorption that comes with something challenging. This focused clarity, very meditative, reminded me of attempting a difficult yoga pose. With each bridge I had to strategize about how best to move across it—how to move feet and arms, how to balance. Sometimes it wasn’t until I had reached the other tree, having tried more than one approach, that I had it figured out. It soon became obvious that using the tweezle with grace and speed was as much a part of moving along on this course as was scaling each element. Despite many concentrated efforts, the tweezles and I did not connect with grace or speed. But they too engaged my complete awareness. Pausing briefly between elements, I realized that the three of us were doing this course quite separately, each of us in our own way and at our own speed. My grandson, this being his fourth time at the park, scampered ahead of me. Caught up in my own challenges, I was mostly unaware of what he was doing. My son, behind me, watched and, in what seemed an interesting role reversal, encouraged me. “Great job, Mom!” He moved across the bridges with much greater speed and confidence than I did. In these brief pauses, I became frustrated with how slowly I was moving, fearing that I was holding back the group that was just behind us. My son assured me it was fine. Was it? On the most challenging bridge, what was under my feet and what I held onto moved; some pieces of diagonal wood hanging from above kept getting caught in my harness, and the pattern of ropes under my feet required shifting orientation frequently—go sideways now, right foot first, then forward, then sideways, left foot first. At one point I was completely stuck, feeling that I could not move my back leg. I was instantly reminded of fearful moments for my yoga students when they say, “I can’t.” Knowing that they can, I encourage them to try. With this realization, I somehow compelled my back leg to move and made it across. 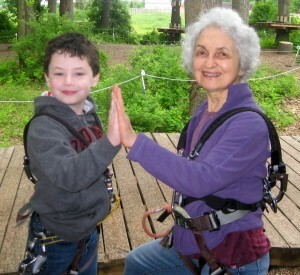 At the end of the course, the zip line was a fun ‘piece of cake’, with my grandson waiting below to greet me. My son joined us, and, although there was still time for us to try another course, we didn’t. With many muscles exhausted, I was ready to stop. This was hard work! I wanted to try another course for sure, just not then. As we made our way to the car, though, I felt badly that I didn’t do well on this course. It shouldn’t have been this hard for me. I should have done better at it. Why didn’t I get an A? Hey, I’m a yoga teacher. I should be good at this. For a few days I struggled with this ‘not good enough’ idea, and then attempted to make myself feel better by reminding myself that I’m 70—much older than anyone we saw at the park—and had never done one of these courses before. Given that, I should get, well, at least a B on my performance. Not surprisingly, this argument didn’t make me feel better. Gradually, moving more into my yogic self, I asked myself the real question: why did I have to evaluate my performance at all? Hey, I’m a yoga teacher. I should know better. I should be able to leave my western, competitive self far behind, and to savor each moment. But I had structured this experience as some kind of competitive ‘deal’—really a deal with myself. Fortunately, my grandson didn’t view this as any kind of competition. The self-evaluation left me sad. It took away from the many ways in which the experience itself was special and fun. On a lovely spring morning in a beautiful woodland I had a new and challenging adventure with my son and grandson. What a great way to celebrate a nine-year old’s birthday! How fabulous to be a grandma still healthy enough to have this kind of birthday celebration! So when my grandson comes to visit in Maine this summer, there will be no deals. Just fun. Just being with whatever happens. This entry was posted in Adventure, Being a yoga teacher, Competitiveness, Self-evaluation. Bookmark the permalink. Thank you for sharing this wonderful experience. I both love and hate the opportunities that challenge us to new perceptions of ourselves and shake us out of ‘what we think we know’! A good way of putting it, Gail. If I had made my way through this course with grace and speed–being ‘good’ at it–I might well have lost the opportunity to ask myself what is really important. What a thoughtful and thought-provoking reflection! Thanks so much, Steffi. Even with this blog finally written, I am still grappling with these issues. You just have told me how much you love all of this, Lisa. Coming from an accomplished writer, yogi, mother and member of my son’s generation, your words are very moving.